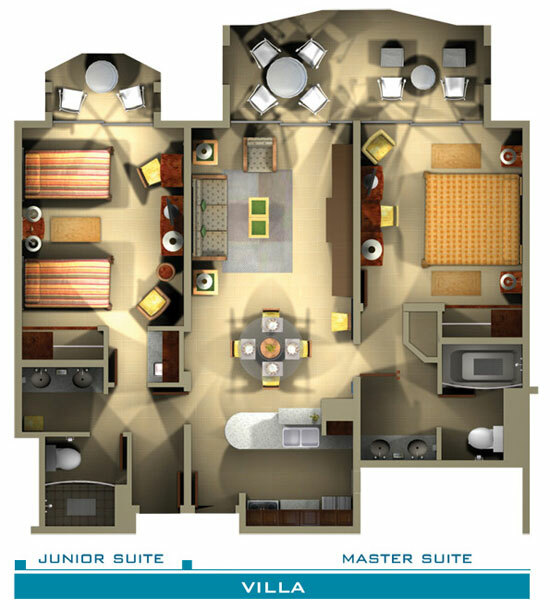 Looking at the floor plan of The Villas at Simpson Bay Resort you will notice that you will have a luxury stay during your vacation in St. Maarten. The villa is a unit that can accomodate comfortably 6 people. In your villa you will find a master bedroom with a king size bed that can accommodate two people, then, outside of the master bedroom there is a spacious living area when you will find to pull down beds (Murphy beds) for two people and finally a secondary room with two double beds that can accommodate two more people. All our villas are equipped with two full bathrooms a full kitchen an spacious terrane. In every corner of your villa you will find luxury amenities from dvd players and flat screens to hair dryers. This villa can be split according to your needs. Choose the whole villa if you are coming with 6 people, choose the Suite side with the master bedroom, kitchen and living area for 4 people, or stay in a comfortable Jr. Suite which is the secondary room with private balcony, full bathroom and kitchenette. Nothing can compare to standing on the balcony of The Villas at Simpson Bay Resort in St. Maarten. Book your next Caribbean vacations online now and get advantage of our new promotional rates.